Cora, who had recently turned three, ran straight for the tent in the middle of our room, grabbed the teddy bear, and hugged it tight. A s’mores kit, Lake Tahoe coloring book, lantern, and activity kit were also inside the tent, set up. There was even real bedding. It’s called the “Just for Kids Indoor Campout,” a special package you can add on to your room (when available) for an extra $100. Cora’s excitement made it all worthwhile, and making the room kid-focused was the perfect boost of positivity for our first ski trip together. There’s no doubt that The Ritz-Carlton Lake Tahoe is the most luxurious accommodation at Northstar. But what you wouldn’t expect is that the vibe is welcoming—not the least bit stuffy or uppity for a five-diamond resort that has been winning awards since it opened in 2010, including Condé Nast Traveler’s “Best Places to Stay & Ski” #5 Readers Choice Award 2011 and Condé Nast Traveler’s “Top 10 Resorts in the United States” #10 Readers Choice Award, Best in the World 2011. You can even walk into the upscale Manzanita restaurant in your ski boots! Nope, it’s a contemporary-luxe lodge designed to make guests feel like they are a part of the nature surrounding them. Just look out the floor-to-ceiling windows. There are 170 guest rooms and suites with a gas fireplace in every room. Fireplaces are romantic, but let’s move on to the ski stuff. The lodge is located mid-mountain in the Highlands with ski-in, ski-out access to the Northstar lifts, has True North—an on-property ski, snowboard, and mountain equipment retail and rental store—and accommodations here include Mountain Concierge service, which means a ski valet to you and me. Drive up to the resort, and the valet will take your skis off the car and keep them in valet. Call the next morning when you’re ready to hit the slopes, and the skis will be waiting for you right on the snow. But let’s face it, those are perks the parents can get used to. What about the kids? All you have to do is tell your kids about the outdoor fire pits and the s’mores packs, and they won’t leave you alone until you take them to it. For Cora’s first time on the slopes, we thought it’d be best if she learned from a pro. Danke was friendly, patient, and encouraging with Cora—everything we wanted to spark an early interest in skiing. And it stuck! Cora talked about skiing “on the snow!” for six weeks after our trip ended. As a bonus, you can book a teacher for your child at Northstar’s Adventure, Guiding & Learning Center (530.562.3500). Since she was only three years old, a few hours was a great beginning. Private lessons are available in three-hour ($475) and six-hour ($675) sessions. There are actually a wide range of options when it comes to ski and boarding lessons for your kids. Look for the Lucky Stars ski school program for three-year-olds just starting out, and the Super Stars for four- to six-year-olds just starting out. And if your toddler or child is not yet potty trained or has no interest in hitting the slopes, don’t miss the impressive licensed childcare service, Minor’s Camp, at the entrance to Northstar. Here are some great tips for finding the right lessons for your kids. I actually worked at Northstar way back in the day when the village looked nothing like it does today. 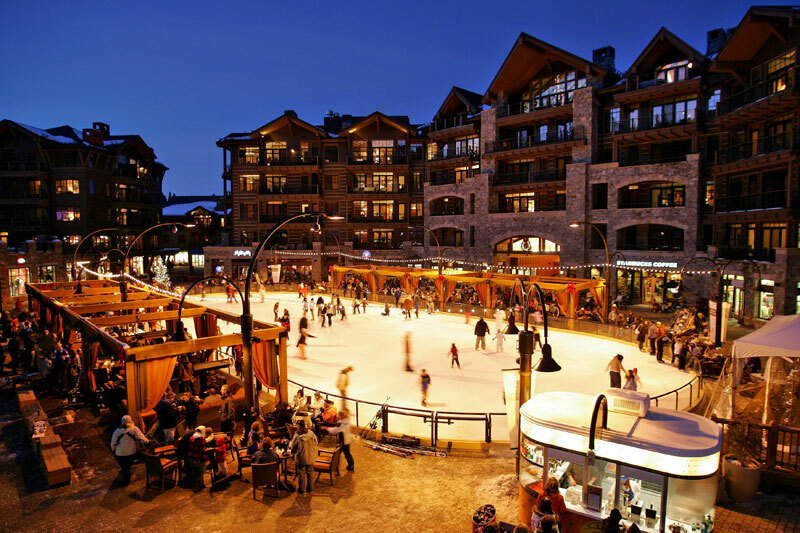 The ice rink serves as the center piece blanketed by restaurants and shops. There were three places that were particularly hard for us to leave: Ambassador Toys, The Chocolate Bar, and Euro Gelato. Northstar suits families with children of all ages. Want proof? There is an endless list of activities available. Some of the winter mountain activity highlights include ice skating, moonlight snowshoe tours, and tubing. Is there a downside to Northstar? Yes. It’s decidedly more fun with more people. We enjoyed our mother-daughter adventure, but I’m confident we would’ve had more fun with more people to play with. And not just Daddy. Invite another family to join you—there will undoubtedly be more laughs in the gondola and around the fire pits if you do. But every mom needs some time to herself. While the village—and downtown Truckee— has lots of irresistible boutiques, I’ll let you in on a little secret. If you book a manicure-pedicure at The Ritz-Carlton Spa, make sure you do it at sunset for an incredible view. Just look out the windows and relaaaaax. Room rates at The Ritz-Carlton, Lake Tahoe begin at $229 a night. Jen Leo (http://jenleo.com/) is an Epic Mom for Vail Resorts. Her trip to Northstar was hosted as part of her blogging work for EpicMoms.com but her views are her own.